SUN ‘N FUN 2019 TV COVERAGE STARTS APRIL 5! LiveAirshowTV returns to SUN ‘n FUN 2019 with wall-to-wall live streaming television coverage of all the action! First, tune in for the Preflight Show, where hosts Mark Allen and Ric Peterson are joined by Stephanie Stricklen and Dave Keim to bring you all the stories surrounding this year’s event with features, interviews and daily lineups. Built in the style of other major sports pregame shows, the Preflight Show is a great primer for the day’s events to come. Once the airshow begins, you can enjoy every loop, stall and invert of the airshow, hosted by Rob Reider and Larry Strain. 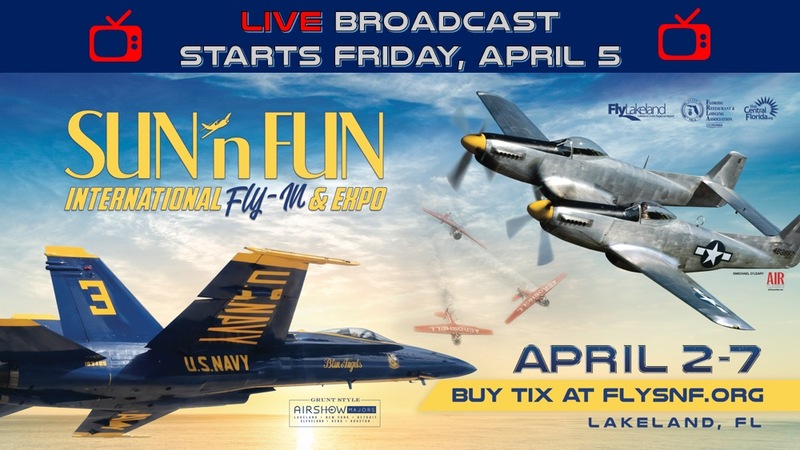 You’ll see live cockpit streaming and expert commentary on warbirds, aerobatic champions, and exciting aerial displays, culminating daily with the incredible US Navy Blue Angels!